JB Transliner is one of the top proper managed express bus agent in Johor Bahru Larkin Bus Terminal. They do not own the coach fleet, however, through proper management of the chartered buses, they emerge as one of the reputable express bus agent in the Johor Bahru. Other than the departures from Larkin Bus Terminal, JB Transliner also provides departures from satellite towns in Johor Bahru like Johor Jaya bus terminal and Tun Aminah bus terminal. 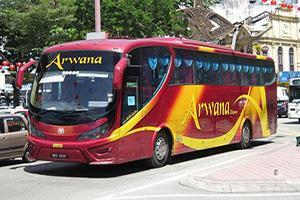 The company specializes express bus service from Johor Bahru to Kuala Lumpur, Shah Alam, Klang and Genting Highlands. Besides that, JB Transliner also provides express bus service to northern region towns like Perak towns (Bidor, Tapah, Kampar, Gopeng, Kuala Kangsar, Teluk Intan, Sitiawan, Kampung Koh, Lumut), Bukit Mertajam and Butterworth. JB Transliner helps to manage the Johor Bahru Larkin counter for a few express bus companies including Arwana Express, Five Stars Express, KPB Express, Kwok Ping Express and Transtar Express. JB Transliner chartered coaches are mainly from these bus companies. KPB Epress has strong presence in Butterworth, Fivestar Express has strong presence in Perak towns area and Transtar Express has strong presence in Genting Highlands.